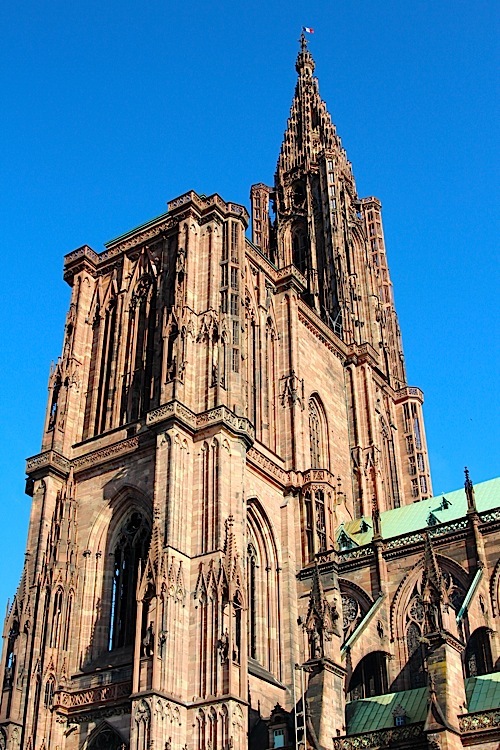 Replacing my lost knitting needles was top of mind as I pulled into Strasbourg, a 2-hour train ride from Reims and just a mile or so from the German border. It had been two days since I lost my knitting case and I was anxious to swatch an idea I’d been playing with. Absolutely charming town that’s a bit French and a bit German. Thirty minutes later all knitting thoughts were lost as I stood gazing in wonder at the Strasbourg Cathedral. This wasn’t my first Gothic Cathedral by any means, my daughter, Jackie and I kind of have a thing for them, but this Cathedral so dominated the central square and quaint town around it that it stopped me in my tracks. Literally. I had heard Strasbourg was lovely, I hadn’t expected it to propel itself to the top of my favorite-places list in less than an hour. What better way to spend the afternoon but to knit, sip a cappuccino, and gaze starry-eyed at the building that was the world’s tallest for a few centuries? So off I went in search of knitting shops to buy new needles. I was pleased to find that not only is the store my friend Carolyn referred to still open but there’s also a new yarn shop called Elle Tricote (She Knits). Both shops are conveniently located on one of the main shopping streets, La Grand Rue, so if you have non-knitters with you they can wander around while you do the important work of adding to your stash. This craft shop carries yarn and materials for needle point and latch hook rugs as well. The yarn selection was simple but nice. There were several brands I was unfamiliar with. I found this bright (really bright!) 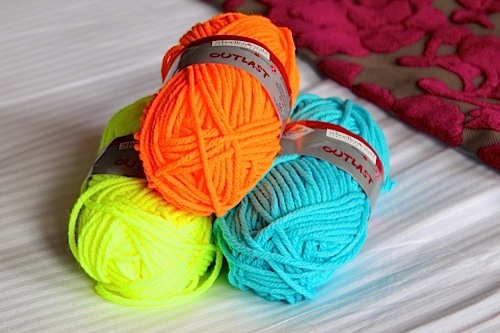 neon yarn called Outlast, that’s meant for sporting attire. “Not too hot, not too cold” is the yarn’s slogan. Why not, I decided and bought a few wildly contrasting balls to design a snow boarder hat. This shop did not carry circular needles. The owner indicated that they never carry them. Mmmm, off to the next shop. Now this is a LYS! Beautifully organized yarns, a pretty presentation and amazing sample sweaters and scarves. It’s located on a tiny side street off La Grand Rue near the Little France section of Strasbourg. The owner was knitting (always a good sign) and spoke some English. The yarns carried were mostly Lang, not a manufacturer I see that often, so I was content to browse the store. 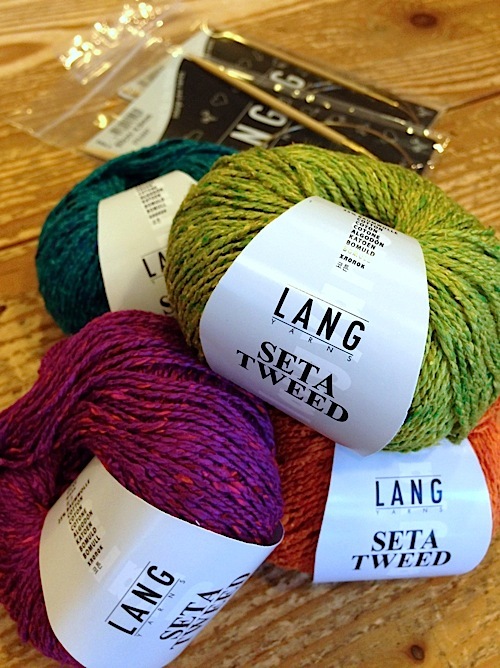 I eventually settled on Seta Tweed, a silk/cotton in bright (but not blinding) contrasting colors. They had circular needles but very few. Evidently they’re more popular in the States. Elle Tricote has a nice web site too, elletricote.com, that lists their other stores in Paris, Lyon and Lille. TTFN, I’m off to swatch, sip and savor the sights. I love Strasboug! Thanks for the photos…takes me back to my time as an IBM SE, living/working in Stuttgart for 3 months during one summer in my single years! I visited Strasbourg by car, and the journey to/from was all a big adventure as well! This entry was posted on July 30, 2014 by Laura Cunitz in General, Yarn & Yarn Shops and tagged knitting, Strasbourg, Yarn Shops.